If you're like many Americans, you might find you're saying "debit" instead of "credit" more often at the cash register. Debit card use rose dramatically in the last decade, surpassing credit card use in 2006, according to Federal Reserve estimates. When you check in, the hotel puts a temporary hold on your account for more than you might spend, say $250 a day, to protect itself against losses. Once you check out, the hotel removes the hold and charges you the correct amount. 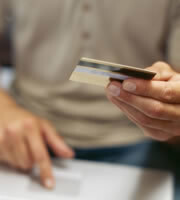 If you use your credit card, the hold is put against your credit limit. But if you use your debit card, the hold freezes that cash in your checking account. Better to have a portion of your credit limit frozen for a few days than your cash flow restricted. Under federal law, you're liable for no more than $50 per credit card in case of fraud, and many credit card companies have zero-liability policies. But with debit cards, your liability is limited to $50 only if you report the problem within two business days. After that, you could be liable for hundreds. Take advantage of the stronger credit card fraud protections and use your credit card to shop online. Crooks are making a bundle by attaching card readers and secondary PIN pads on gas pumps to skim credit card and debit card numbers. It's no picnic if they steal your credit card number and run up phony charges. But if they get your debit card information, they could drain your checking account and any linked savings accounts. Even if you report unauthorized usage quickly, you could be without the stolen cash for a few days while the bank investigates. Although you still must call your credit card company to resolve unauthorized purchases, your cash flow isn't disrupted while the problem is investigated. It's tough to get your money back if you use your debit card to purchase something that turns out to be defective. Many credit card companies will provide purchase protection on items that retailers refuse to take back. The peace of mind of knowing your big-screen TV can be returned, if need be, may help you sleep better at night. Partner the consumer protection with a great rewards program, and your credit card can serve as a very handy financial tool - as long as you don't find yourself going on a spending spree you can't afford. 1 Responses to "4 places your credit card is a better choice than debit"
"the hotel removes the hold" is inaccurate. Only the issuing bank can remove the hold. This usually happens when the bank posts the charges to the card account. Prior to this, a hold will appear on the account probably described as pending charge. Fox News picked up this story and now millions are misinformed.